Writing and prayer … what could be more natural? As writers, many of us find ourselves praying for inspiration, for guidance, for good news, for acceptance, for positive reviews. So much of writing is outside of the writer’s control. Certainly most of the publishing process is out of the writer’s control and, though this may come as a surprise to non-writers, much of the writing process can be as well. Creativity so often has a mind of its own. 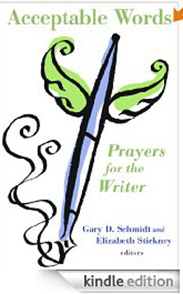 For those who write and pray, Acceptable Words: Prayers for the Writer offers a compendium of prayers for, and for the most part by, writers. I first found this book when searching Amazon for anything and everything written by one of my favorite middle-grade authors, Gary Schmidt. Turns out he and his wife, the also very talented writer Elizabeth Stickney, put this wonderful volume together. In addition to entries written by those who are perhaps the “usual suspects” – C.S. Lewis, George McDonald, Thomas Aquinas – it includes prayers from Jane Austen, e.e. cummings, Madeleine L’Engle, and two of the three Bronte sisters. Somehow I feel better just knowing that even these fabulous authors felt the need and desire to pray.